Latinos who benefitted from Ronald Reagan’s signature immigration law are mourning the late president’s wife Nancy Reagan, who passed away Sunday at her home in Los Angeles at the age of 94. The former first lady was best known for her “Just say ‘no’” anti-drug campaign, a public advocacy campaign launched in tandem with her husband’s “War on Drugs.” Behind the scenes, Nancy was widely regarded as Ronald Reagan’s top confidant, adviser and supporter. For Latinos who gained legal status and citizenship under the 1986 Immigration Reform and Control Act, Nancy Reagan’s death represented the last link to the pro-immigrant compassionate conservatism of the Republican Party. The bill benefitted an estimated 3 million immigrants, plus family members that would later gain an advantage in the immigration process through reunification rules. Nancy Reagan’s legacy is that of a bridge between the old and modern roles of women in politics. At a time when The Eurythmics criticized the phrase that “behind every great man there had to be a great woman,” Reagan both embodied and pushed past it, working behind the scenes. As First Lady Michelle and President Barack Obama wrote in a statement following Nancy Reagan’s passing, "Our former First Lady redefined the role in her time here." For example, Nancy Reagan is credited with pushing Mr. Reagan to publically apologize for the in the Iran-Contra affair, which illegally funneled weapons sales cash to anti-government guerillas in Nicaragua. While Ronald Reagan’s drug war fueled civil conflict Central and South America with conflict, his 1986 Amnesty bill provided humanitarian relief to those fleeing socialist revolutions and U.S.-backed dictatorships. Ronald Reagan was the first of many presidential candidates to employ the phrase “Make America Great Again,” the campaign slogan of current GOP presidential candidate Donald Trump. While Trump took up Reagan’s slogan, he rejected both the stately tone of his debate style, and his compassionate policy views on immigration, opting for a more aggressive approach. 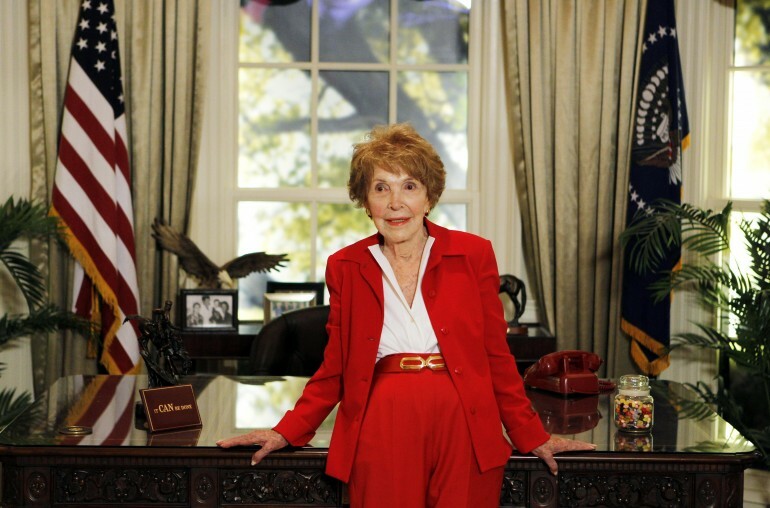 For many Latinos, Nancy Reagan’s death severs the cord to the Republican party that they knew. The sentiments poured out over the weekend on social media and on the comments pages of news articles reporting her death. “Rest in peace, [great] lady, thank you for influencing president Reagan to help the latino community. [My] condolences to her family, may God bless them all,” wrote user Griselda Velazquez on an article published by Variety (we can’t confirm the authenticity of the account). On social media, Nancy Reagan’s death inspired the circulation of a presidential forum in which Ronald Reagan and H.W. Bush speak about immigration. Here’s a retweet of the video from Mexican politician Gerardo Flores. GOP candidates also paid their respects to Nancy Reagan on Twitter.